It’s the tarragon that really makes these quesadillas! To be honest, I only put some because I had it left over from the spaghetti squash recipe the other day… But it turns out it goes beautifully with avocado and really lifts the other flavours too! The avocado mixture would also make a great dip, and I can see it working well as a baked potato topping. The vegan cheese in the quesadillas is optional, but it does help them to stick together. Put the black beans and sweetcorn in a large bowl along with the coriander and tarragon. Halve the avocado, remove the pit, and squeeze the flesh from the skins into the bowl. Mix together with a fork, mashing slightly as you go. Stir through the lemon juice and seasoning. 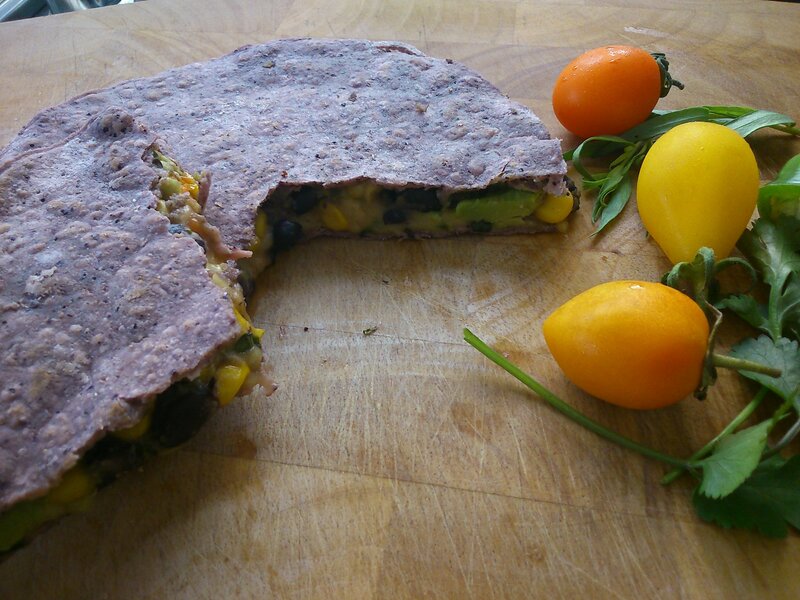 For each quesadilla, spread 1/5 of the avocado mixture onto a tortilla and then arrange 2 tomatoes, a few slices of chilli and a sprinkle of vegan cheese on top, and then a second tortilla. Heat a little oil in a frying pan on a medium heat. Carefully transfer the quesadilla to the pan and cook for 4-5 minutes until crisp on the bottom. Spread a little oil on the top of the quesadilla and then flip it over. Cook for a further 4-5 minutes.